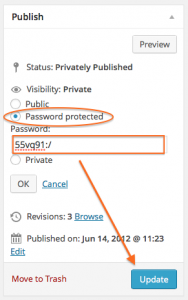 This method will make the Page or Post available to only members of your website who can login. 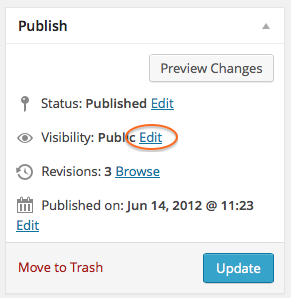 Publish or Update your Page or Post. 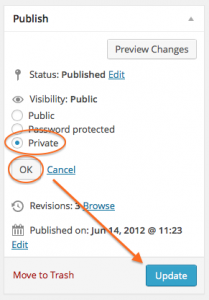 Your Page or Post is now Private. This means that only members of your website who are administrators or editors will be able to see the content. Anyone else will receive a “Not Found” message. Publish or Update your Post or Page. 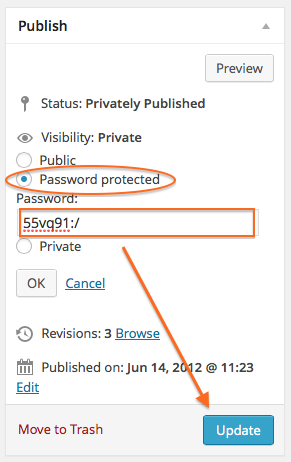 Your Post or Page will be marked as Protected and require visitors to type in the password you created. You will need to share this password with people who need to see the content. Note: While this does protect the page content from casual visitors, if your visitors share the password with others or leave their browser open, others may have access to the content.